Abolore Akande popularly known as 9ice has wedded a certain Adetola, in Badagry, Lagos. According to multiple sources online, the new wife is a U.S-based Engineer and businesswoman. She couldn’t make it down to Nigeria for the marriage, so she gave her speech via Skype. 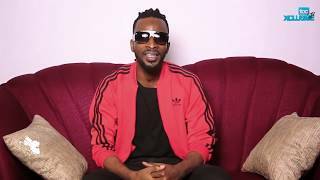 9ice got engaged to her around May, 2018 and she is said to be currently pregnant. Phones were banned from the wedding but we somehow, pictures and the video flooded the internet. This is his second shot at marriage after his first one collapsed and he welcomed 3 other children from two different babymamas. Exclusive: 9ice secretly marries for the 2nd time, through Skype . . Nigerian singer, 9ice, is currently getting married, traditionally, to his fiancée, Adetola, in Badagry, Lagos. . . This is his second shot at marriage after his first one collapsed and he welcomed 3 other children from two different babymamas. . . The new wife is a U.S-based Engineer and businesswoman. She couldn’t make it down to Nigeria for the marriage, so she gave her speech via Skype. . . 9ice got engaged to her around May, 2018 and she is said to be currently pregnant. Phones were banned from the wedding but we somehow got our hands on some pictures and the Skype video made by Adetola.